His name might not be as well-known as that of other WWII heroes, but once you read the miraculous story of Desmond Doss, you’ll never forget him! From humble beginnings, this unassuming Virginia native would make a vow that he’d carry with him his whole life. He was the subject of endless abuse due to his beliefs, but no one could have foreseen how they would later contribute to his astonishing acts of heroism on the battlefield. Find out how this small-town boy with a heart of gold went up against all odds to save dozens of his fellow soldiers without ever touching a gun. Don’t miss this heartwarming tale of faith and heroism – read on! 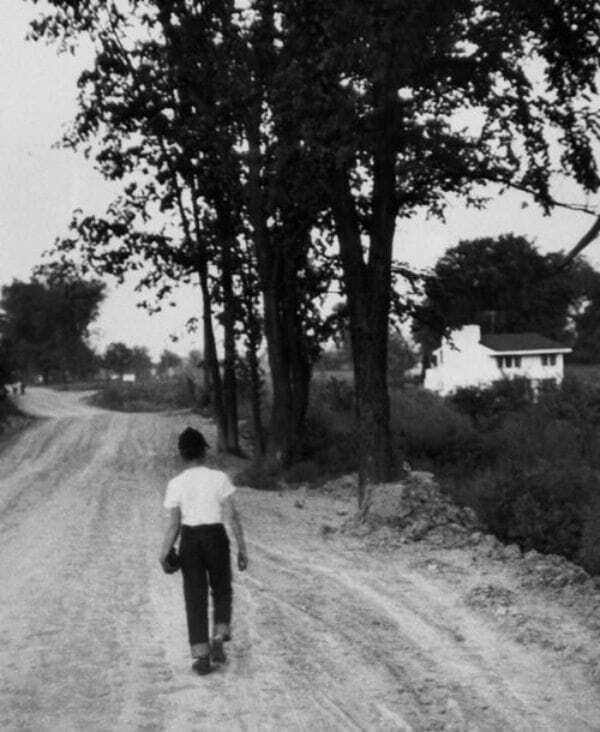 Growing up in the small Virginia town of Lynchburg, Desmond T. Doss was a quiet, lanky kid who despite his humble beginnings was destined for greatness. He was born in 1919 to carpenter father, William Thomas, and homemaker/shoe factory worker mother, Bertha. Doss was the family’s second of three children. He was generally considered an ordinary child, but no one could have guessed that he’d grown up to have such a remarkable legacy as one of America’s most extraordinary heroes. 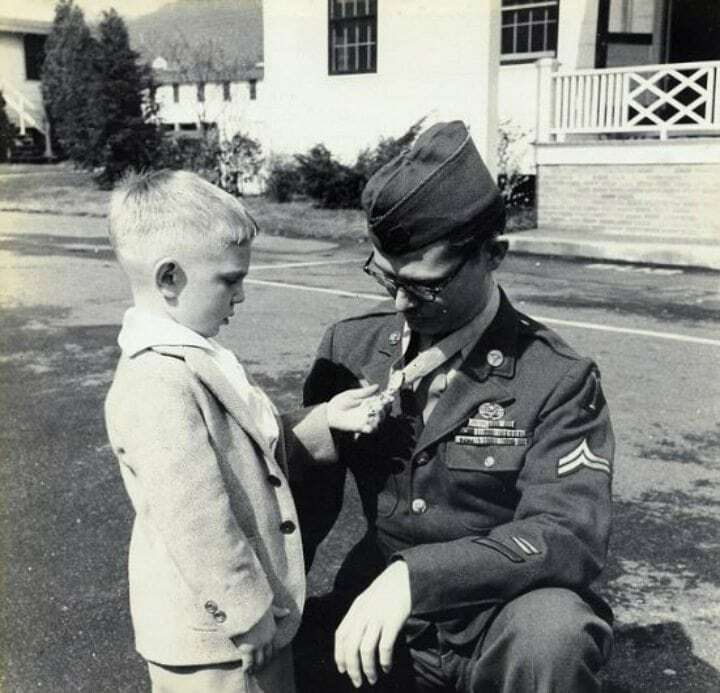 There was one particular aspect of Desmond Doss’ upbringing, however, that set him apart. Doss was raised as a Seventh-Day Adventist – a Protestant Christian denomination that is distinguished by its observance of the Bible’s Ten Commandments, and one in particular. According to his religious beliefs, Doss was a steadfast observer of the biblical day of rest on the Sabbath on Saturday. Little did he know then, but his unshakable adherence to his beliefs would inevitably change the course of his life. Although no one yet knew the extraordinary role it would later play, Desmond Doss demonstrated signs of profuse empathy from a young age. As a young boy, he once walked six miles to donate blood to accident victim after hearing an announcement on the radio. A few days later, the young Doss again made the long trek by foot to help the complete stranger. His generosity of spirit was already obvious, but no one could have expected how his care ways would end up affecting dozens upon dozens of lives. Along with keeping the Sabbath and adhering to a vegetarian diet, Doss was instilled with a strong notion of nonviolence growing up. During his childhood, his father brought home a framed picture of the Ten Commandments with vivid illustrations that would have a lasting effect on him. The one that most struck young Doss the most was the Sixth Commandment: “Thou shalt not kill.” Doss remembered the striking drawing of the biblical figures Cain and Abel that accompanied the words. With that picture firmly ingrained in his mind, he pledged never to take a life. Another distressing event, though, would further instill his views that would make him famous. Along with his vow to never take a life, Desmond T. Doss developed a strong disliking of weapons from an early age. Along with his religious teachings, those sentiments grew after watching his father pull a gun on his uncle during a drunken argument. His mother eventually managed to seize the pistol from her spouse and instructed her young son to go hide it. Shaken by the episode, Doss vowed that that would be the last time he’d ever touch a weapon. And amazingly he’d stick to that principle despite the perilous path he had ahead. With his pacifist beliefs in mind, young Desmond Doss spent his childhood engaging in activities like flattening pennies of the railway tracks and wrestling with his little brother, Harold. Harold admitted that it was frustrating to wrestle with his brother since his sheer determination, and not necessarily his skill, made him undefeatable. 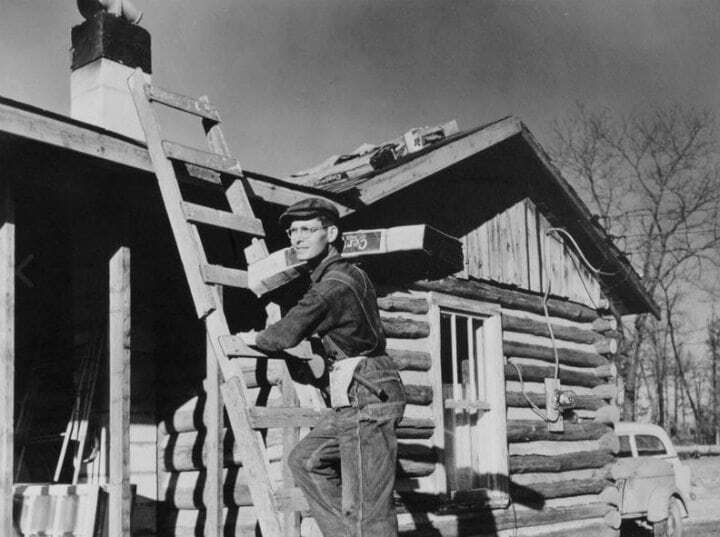 After eighth grade, young Desmond Doss left school and found a job at a lumber yard to help support his family during the Great Depression. Doss undoubtedly took on an extraordinary amount of responsibility at a young age, but that was hardly the last time he’d demonstrate his selfless ways. 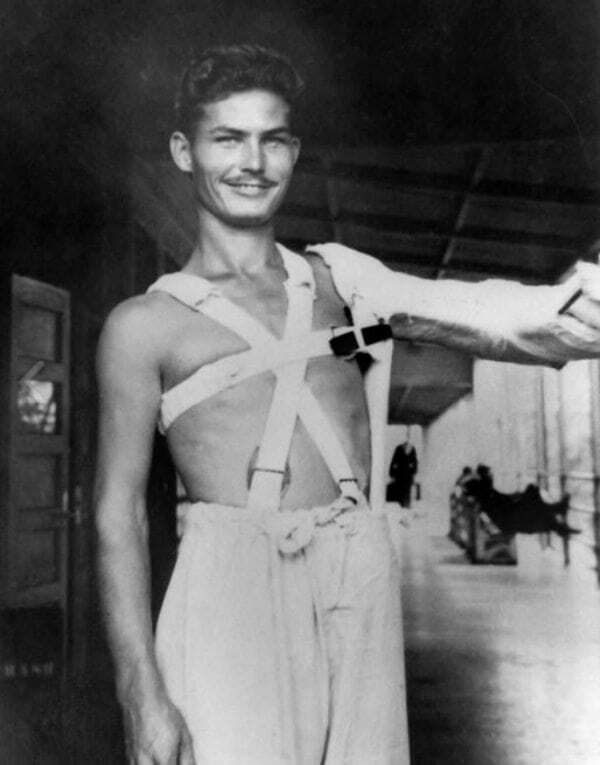 Desmond T. Doss was a diligent shipyard worker when, at the age of 18, he dutifully enlisted into the U.S. Army. 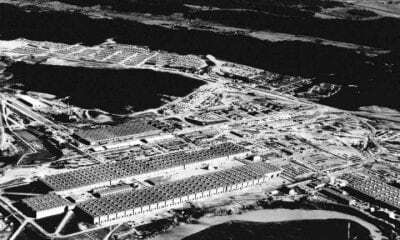 When Pearl Harbor was attacked, he was given the option of a deferment to keep working at the shipyard. However, Doss wanted to do more and gladly jumped at the chance to help his country on the front lines. The decision would henceforth shape his life. Given his views against killing and working on the Sabbath, though, no one could have expected the unbelievable result of his military experience. 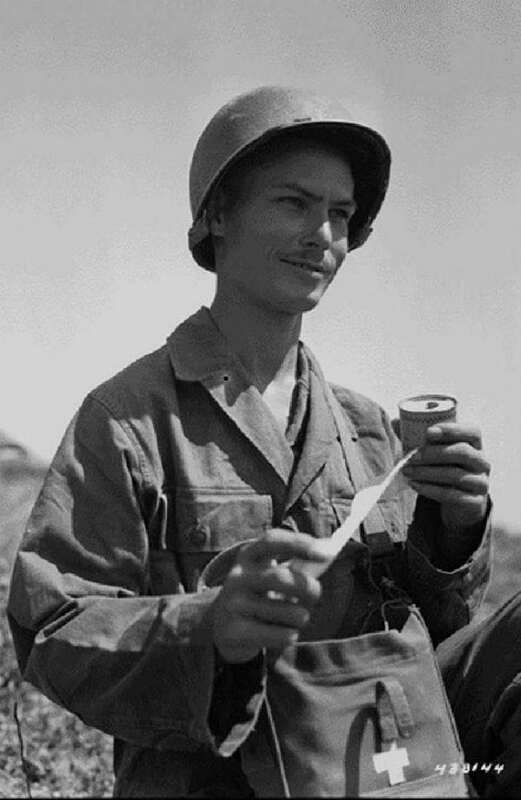 Not long thereafter, Desmond Doss was assigned a post for basic training. When the day finally rolled around, he kissed his girlfriend, Dorothy, goodbye and entered active military service. Hoping to contribute without a weapon, he had enlisted as a combat medic. However, the Army had other plans for him. 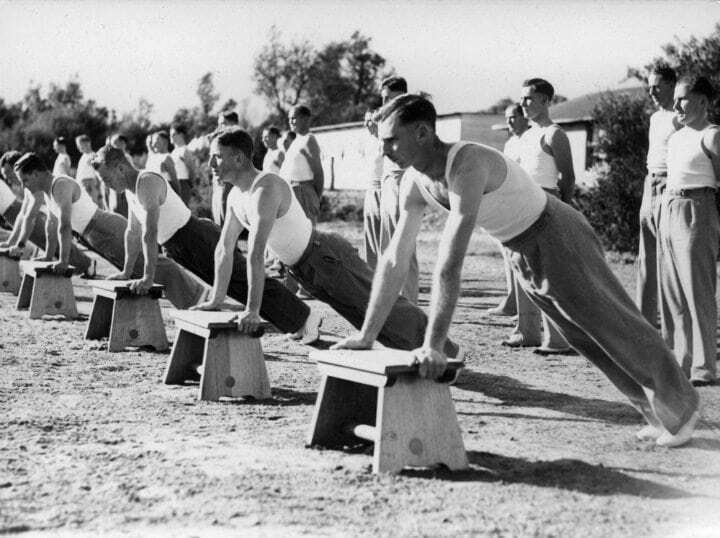 On April 1, 1942, the eager 23-year-old was sent for training at Fort Jackson in South Carolina. Much to his dismay, though, he had been assigned to a rifle company with the 77th Infantry Division. As if that wasn’t surprising enough, Doss couldn’t have prepared himself for what was about to come. Despite his enthusiasm for serving his country, Desmond Doss wasn’t met with the welcome reception he’d expected in the Army. “He just didn’t fit into the Army’s model of what a good soldier would be,” said documentarian Terry Benedict. While Doss was sure he could be of great use even though he refused to carry or train with a weapon, his fellow soldiers had other views. What started as harassment soon spiraled into something much worse for the young soldier. Even in the most trying times, Desmond Doss held fast to his creed. But his refusal to hold a gun or engage in active fighting caused his fellow soldiers to lash out at him with abusive behavior. Trying to intimidate him, they would throw shoes at him and scold him while he prayed. No one wanted to befriend the soft-spoken Doss as his comrades perceived him as a liability who wouldn’t have their backs in battle without a weapon. 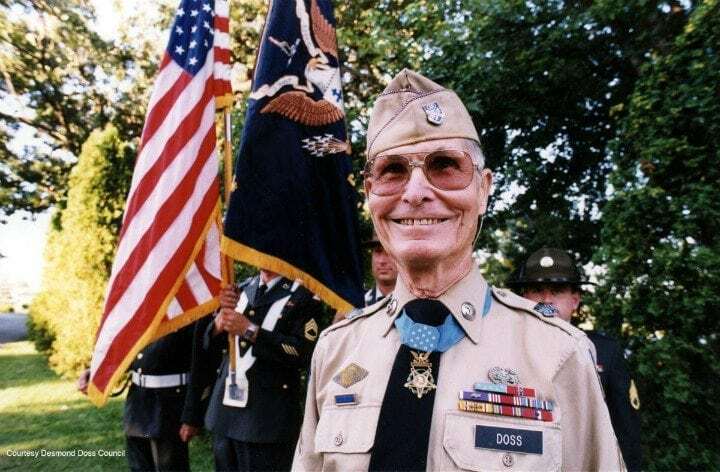 Other soldiers from his battalion later said that at the time, that Doss was viewed as the “weakest link in the chain.” While the intrepid Doss didn’t let the bullies get to him, he had one more request that would make matters worse for him. While it could have been easy to crumble in the face of adversity, Doss maintained an impressive moral and kept his spirits high despite the verbal and physical assaults. 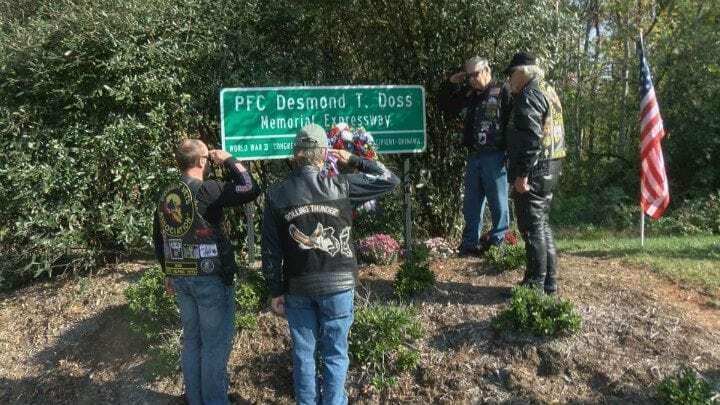 In order to uphold his unwavering convictions, Doss had one more request – an exemption from participating in Saturday training so he could attend church. Doss was granted the exemption, but his fellow soldiers were less than understanding. ”Doss, as soon as we get into combat, I’ll make sure you won’t come back alive,” one fellow soldier threatened. Incredibly, the unassuming Doss didn’t back down. His amazing perseverance had yet to meet its final test, though. As if it wasn’t enough that his fellow soldiers teased him and thought he was a slacker and unfit for the military, the commanding officer of Doss’ battalion, Capt. Jack Glover, tried to transfer him to another unit. However, Doss was adamant that he was there to help and wouldn’t take no for an answer. “Don’t ever doubt my courage because I will be right by your side saving life while you take life,” he boldly told his captain. Still, Glover wasn’t convinced. “You’re not going to be by my damn side if you don’t have a gun,” he bluntly told the keen soldier. But the cruel behavior wouldn’t end there. 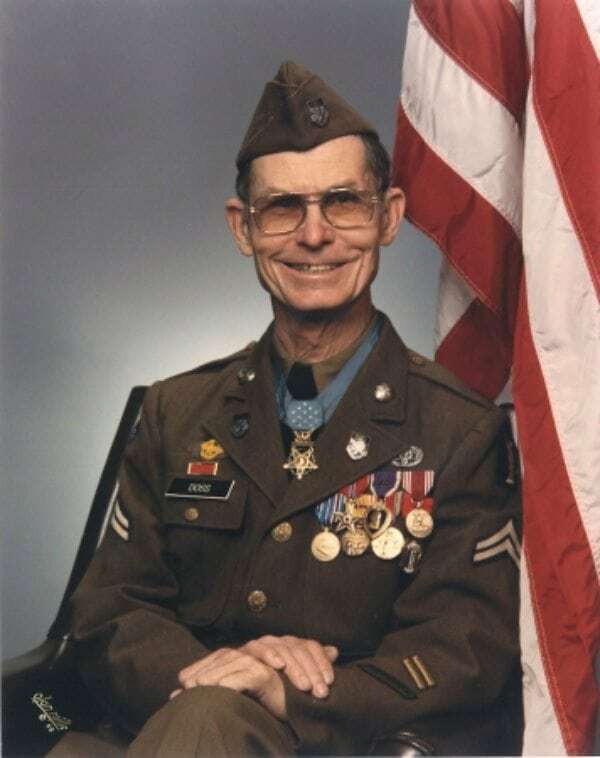 Due to his steadfast faith, Doss earned the label “conscientious objector.” Along with facing constant attempts to intimidate him and get him to quit, Desmond Doss also found he was always assigned the worst and toughest duties on Sundays when he came back for training. He hated the label “conscientious objector” rather viewing himself as a “conscientious cooperator.” He was determined to show that his pacifistic ways were no obstacle to his willingness and ability to help. Despite his earnest desires, Doss eventually faced a legal hearing that ended in the most unexpected way. The Army attempted to court-martial Desmond Doss for disobeying the direct order of carrying a gun. However, despite the Army’s best efforts, they couldn’t force Doss out nor make him carry a weapon or engage in combat. Due to a law passed in 1940, the Army couldn’t legally prevent him or any other conscientious objector from serving. The law also legally allowed him to serve in a “noncombatant” position. Still, no one could have guessed the amazing things he would do. In spite of all the challenges and naysayers Doss encountered during training, he still believed his duty was to obey God and serve his country. Doss incredibly never held a grudge and dismissed the cruel behavior he had faced. While it would have been understandable if Doss wanted to leave, he incredibly never gave up his dream of serving his country. Although no one initially understood why he was in the Army if he wouldn’t fire, or even hold, a weapon, he would soon do something that would completely change everyone’s perception. Even now as a young man, that mental image of the framed Ten Commandments picture from his childhood had stayed with Doss. His resolute willpower and determination to never take a life would soon be put to test though. 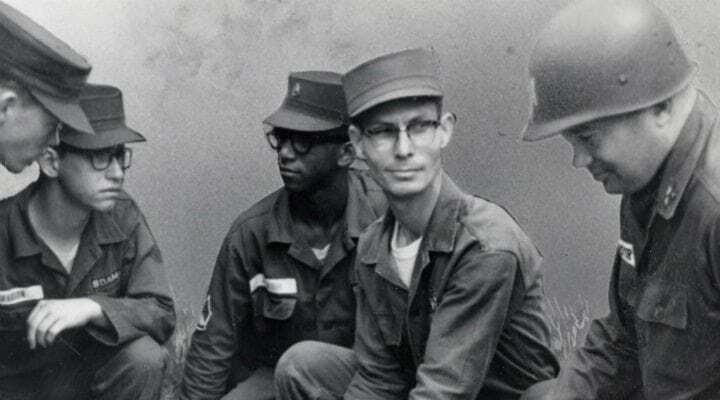 After all of the trials and tribulations of his early Army experience, Desmond Doss finally became the medic that he’d always wanted to be. 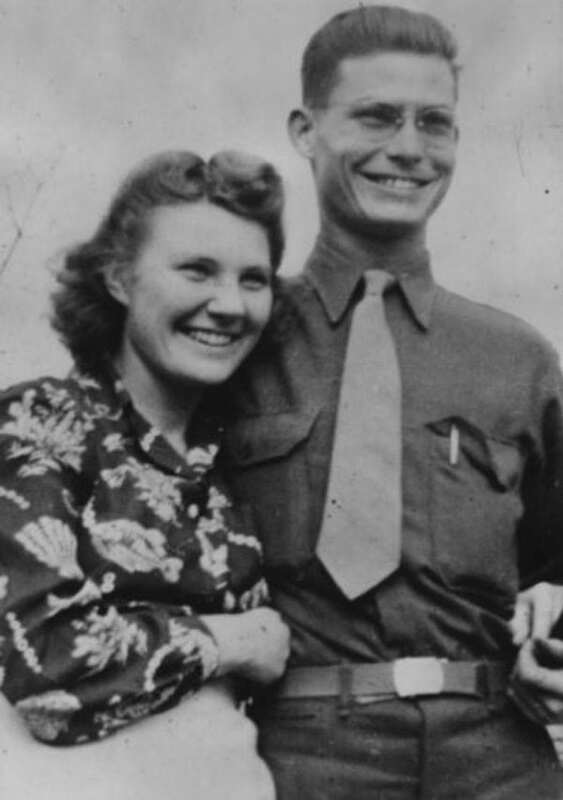 As war raged in the Pacific Theater, Doss was able to quickly marry his girlfriend Dorothy. As they kissed goodbye on the train tracks, Doss knew it wasn’t possibly the last time he’d see her. 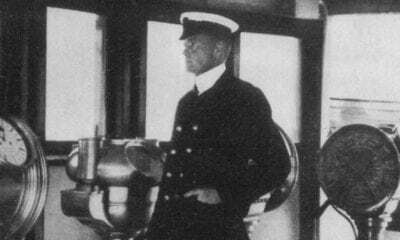 However, armed solely with a Bible she’d given him and his faith in God, Doss shipped off to war. 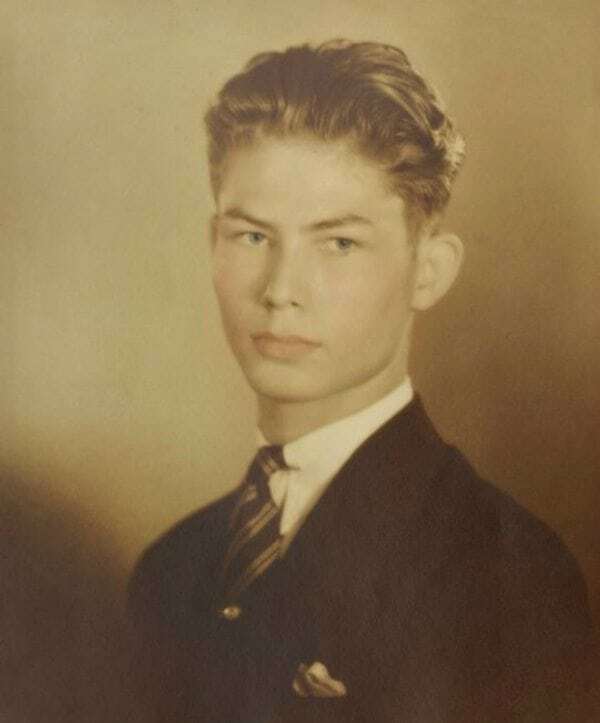 Along with the rest of the 77th Division, skinny Virginia native Desmond Doss made the long journey from America to the Pacific where his platoon first served in Guam and the Philippines before heading on to the fierce frontlines in Japan. 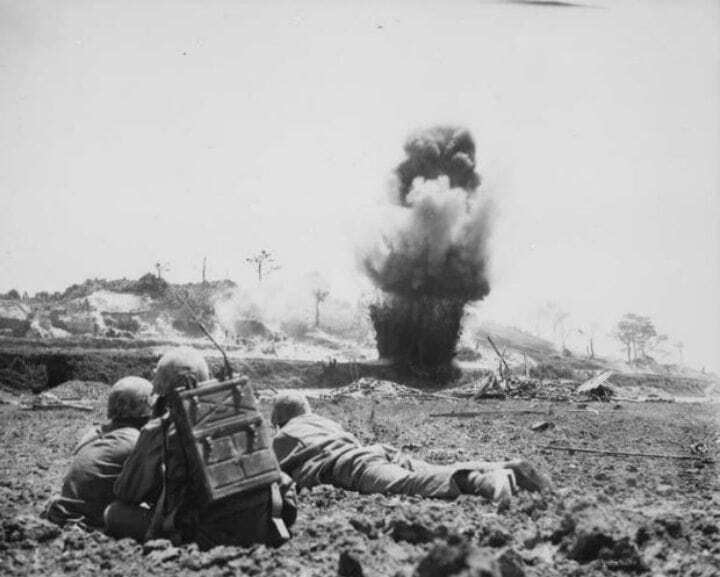 Ferocious fighting and rains raged as Doss and company arrived at the infamous Battle of Okinawa, otherwise dubbed the “rain of steel” for the sheer amount of metal flying from Allied assaults, Japanese kamikaze attacks and intense shellfire. It was there amid all the bloodshed, that the unassuming Desmond Doss would do the unthinkable. 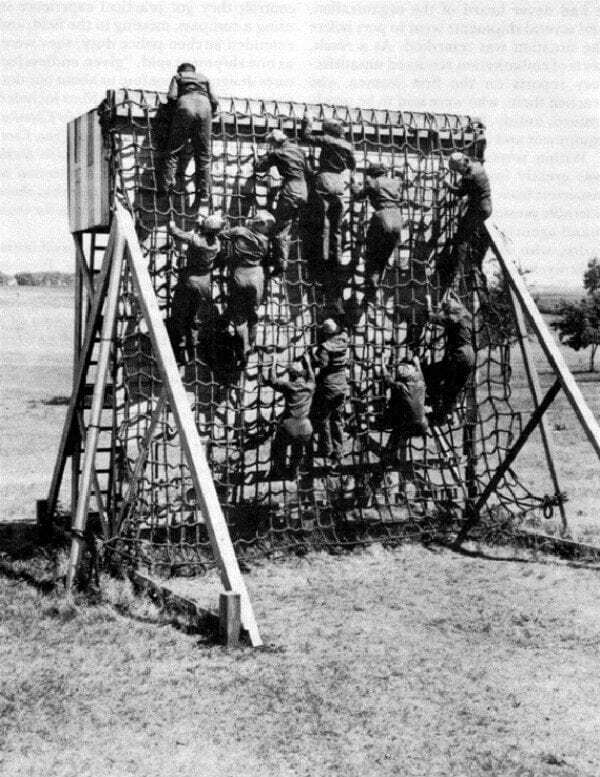 To complete the risky feat, the troops would first have to scale the jagged, 400-foot ridge. 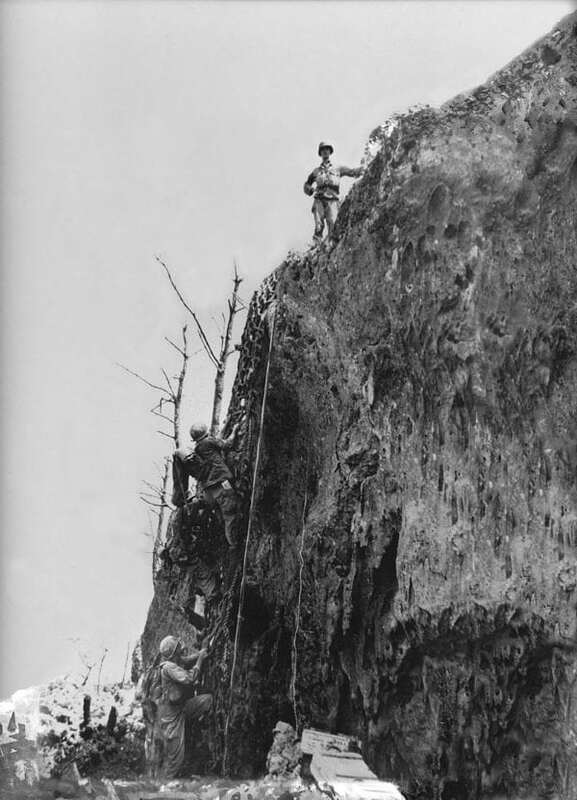 It was none other than Desmond Doss who bravely volunteered to be one of the soldiers who first climbed the dangerous, craggy cliffside to fashion a mesh rope ladder for the rest of the troops to use. Little did they know, but something deadly was waiting for them at the top of the plateau. As the American troops scaled the treacherously steep side of Hacksaw Ridge and emerged at its summit, they quickly came under a barrage of debilitating Japanese gunfire and explosions. 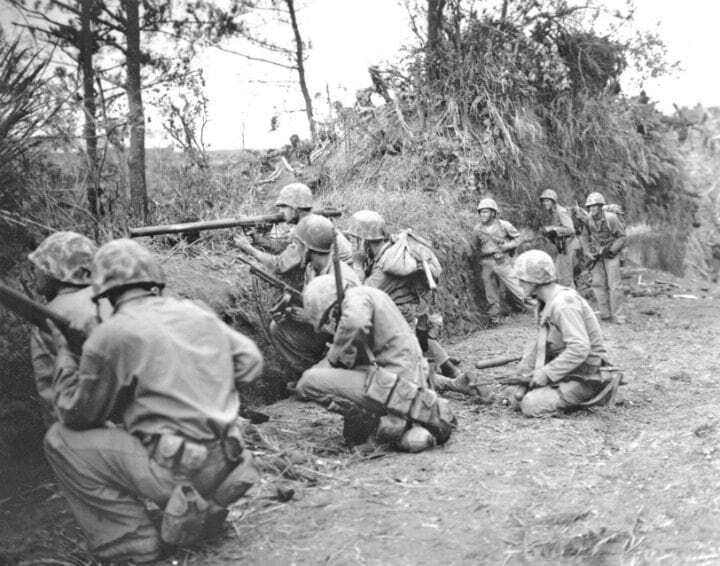 As it turned out, thousands of Japanese soldiers were laying in caves and tunnels awaiting the incoming American soldiers atop the now-famous battle scene landmark. 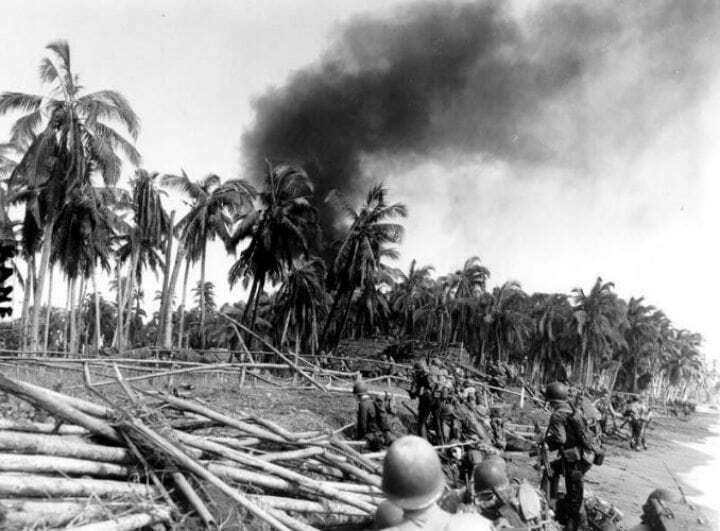 Amid the onslaught, American soldiers started dropping at an alarming pace. After quickly assessing the carnage, they were soon ordered to retreat back down to the base of Hacksaw Ridge. Those of the American troops who were still standing fled – that is – all but one. 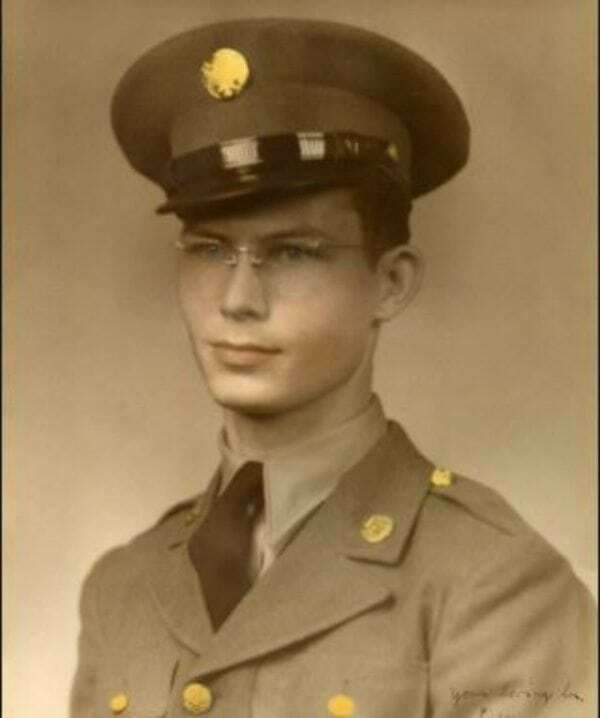 Amid the smoke and mayhem, Desmond Doss bravely dropped to his hands and knees are started crawling from one fallen American soldier to the next checking to see who was still alive. The wounded troops could barely believe their eyes when they realized what Doss was doing. 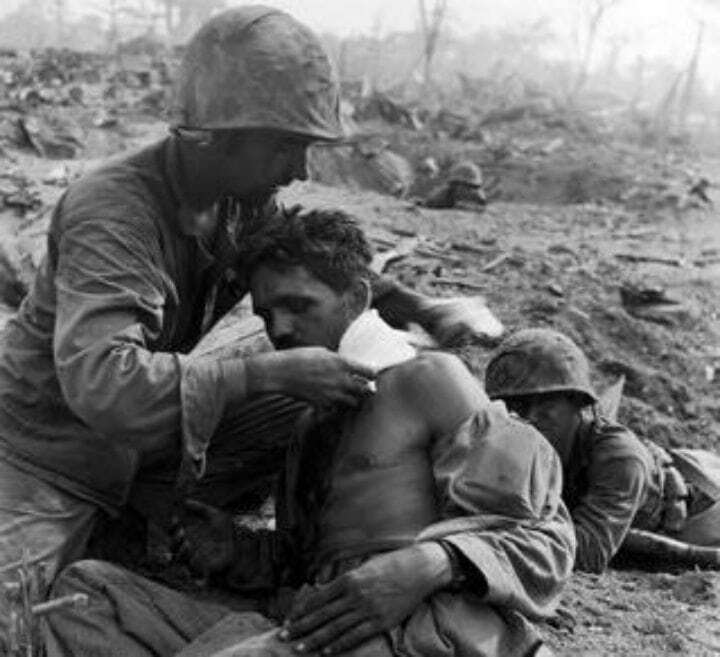 A torrent of ammunition was still whizzing as the mild-mannered medic started treating the wounded soldiers who had been left behind. Unperturbed by the raging battle, Doss dragged his comrades to the cliff’s edge where he carefully hoisted them down to safety using a knotted rope he had already secured. But he didn’t stop there. 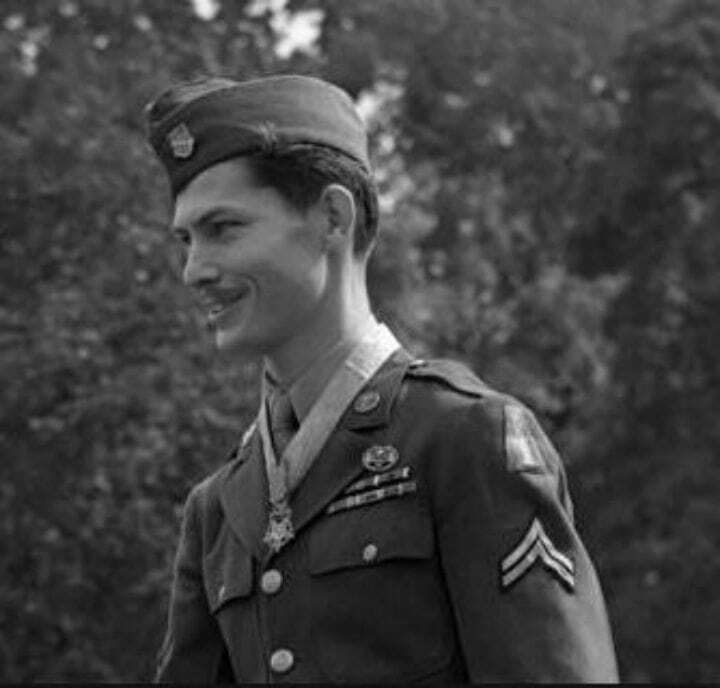 One after another, Desmond Doss continued to brave the battle and run straight into danger without so much as a weapon of his own. As bullets and mortar shells raced passed him, Doss risked his life to save others time and time again all the while coming dangerously close to Japanese positions. Hour after precarious hour others retreated but Doss tended to those who may have otherwise been left for dead. He tied tourniquets and dodged bullets all the while speaking ensuring words to the injured soldiers as he delivered them to safety. More than 12 hours of fierce warfare had raged, when it became clear that Doss had managed to do the unbelievable. 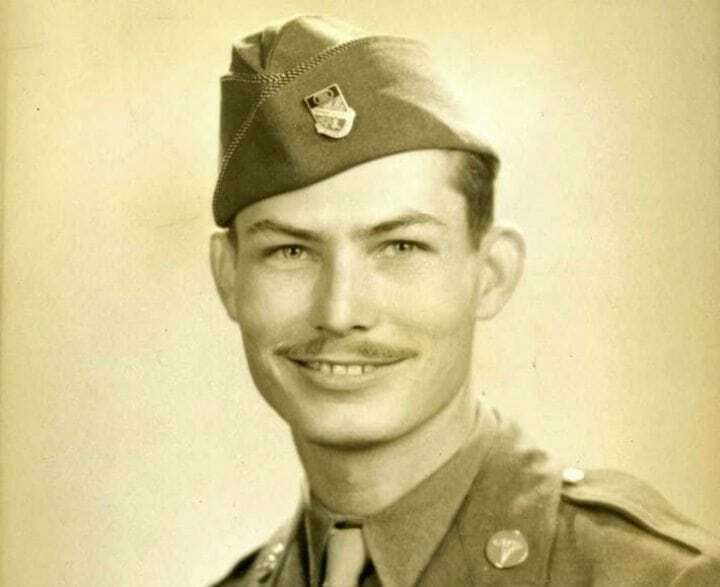 During his heroic life-saving actions, Desmond Doss never forgot his faith. The man who had dedicated his life to nonviolence and to his country had been praying the whole time. “Lord, please help me get one more,” he asked of God after each soldier he treated. Knowing that the Japanese sometimes tortured their prisoners of war, Doss did all he could to not leave a single wounded man behind. His act of superhuman strength still astonishes surviving members of his unit to this day, but at that time, no one could have guessed just how many lives he’d saved. 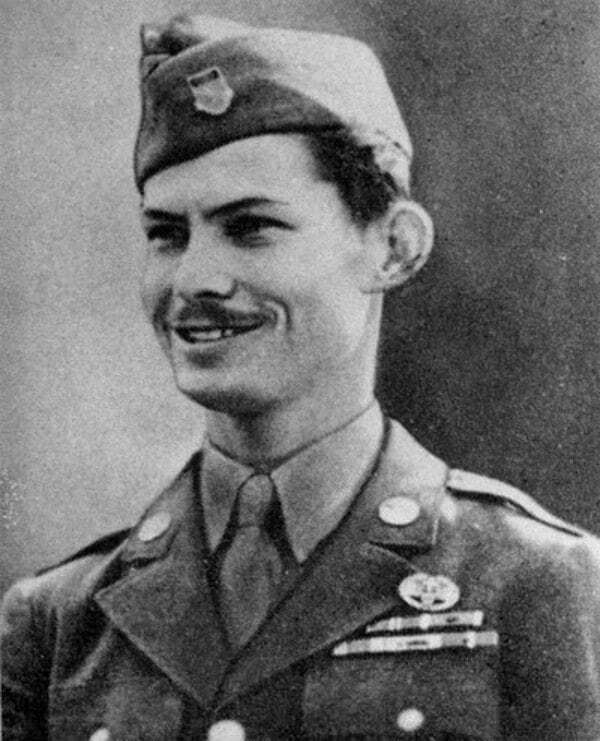 Thousands of fatalities were left in the wake of the devastating conflict, but there were significantly fewer thanks to Desmond Doss. The final assault at the deadly battle at Hacksaw Ridge occurred on May 5, 1945 – which happened to be a Saturday – the day Doss usually took off to observe the Sabbath. Luckily for his comrades, Doss had decided to go into action after a quick read of his Bible. And after more than half a day of exhausting fighting, Doss had amazingly managed to save the lives of dozens of men, including his captain, Jack Glover. While Doss though he’d rescued 50 soldiers, the captain insisted it was 100, so they settled on 75. Unfortunately, though, Doss hadn’t managed to get out unscathed. 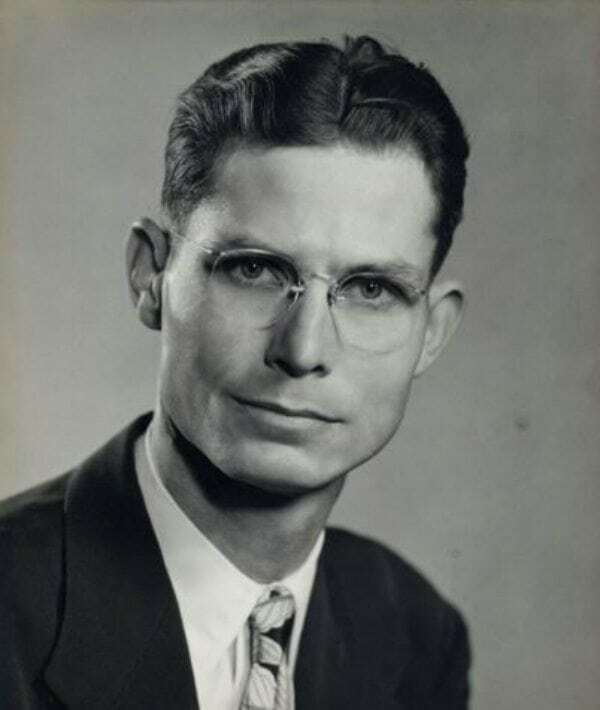 While dodging bullets and crawling through the hazardous battle at Hacksaw Ridge, Desmond Doss was wounded four times. Despite his injuries, Doss incredibly chose to always put others first. At one point, he even jumped out of a gurney so that another injured soldier could be helped. During his miraculous life-saving actions in Okinawa, a sniper’s bullet had shattered Doss’ left arm and 17 pieces of shrapnel had painfully sprayed his body. Amazingly, he tended to his own wounds as best he could and, acting upon his understanding of the Bible, was willing to die so others could live. Little did he expect, but his demonstration of unparalleled selflessness and bravery would be met with a shocking response. Miraculously, Doss managed to stay alive alongside the dozens of men he’d saved. 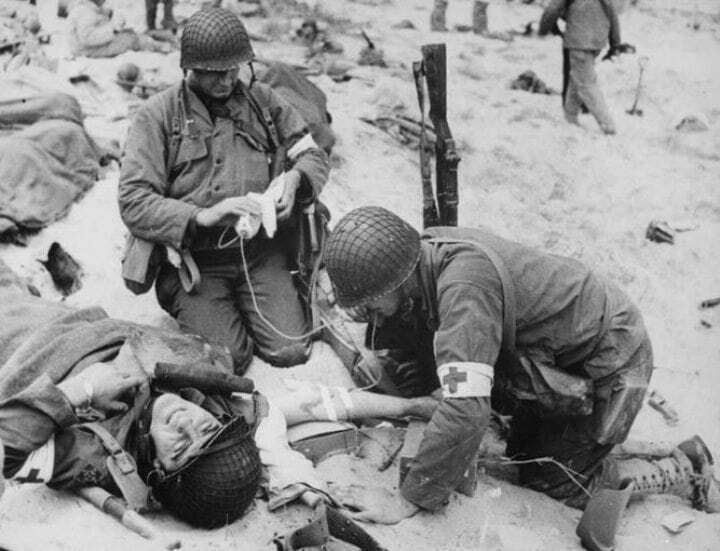 Ashamed of their previous behavior and eternally grateful for his lionhearted actions, the surviving members of Desmond Doss’ unit finally had a change of heart about the medic who they’d previously insulted and mistreated. “He was one of the bravest person alive,” said Capt. Jack Glover, who had previously wanted Doss out of his battalion. “And then to have him end up saving my life was the irony of the whole thing.” Those who had previously underestimated Doss now saw him as the hero he always was. But when asked how he had managed the remarkable feat, Doss had the most humble and heartwarming response. In his amazing display of strength of body and spirit, Desmond Doss single-handedly saved one man every 10 minutes on average during the battle at Hacksaw Ridge. The devout pacifist who had previously been chided for faith, simply said that he credited it all to God. Doss further explained that his main source of strength during his trying time in battle and in training had been a Bible that his wife Dorothy had given to him before he shipped out. Much to his despair, though, he realized that he’d lost the holy book during his heroic efforts in Okinawa. A few weeks later, Doss was evacuated back to the U.S. where something incredible was waiting for him. Desmond T. Doss’ actions were so heroic that they caught the notice of the upper echelons in the White House. 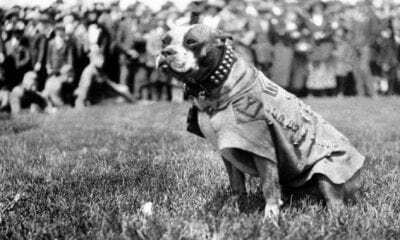 A few months after returning from war, the heroic veteran was invited to Washington, where he would receive well-deserved recognition in front of the entire nation. On October 12, 1945, then-President Harry S. Truman bestowed Desmond T. Doss with the country’s highest military decoration – the Congressional Medal of Honor. “You really deserve this. 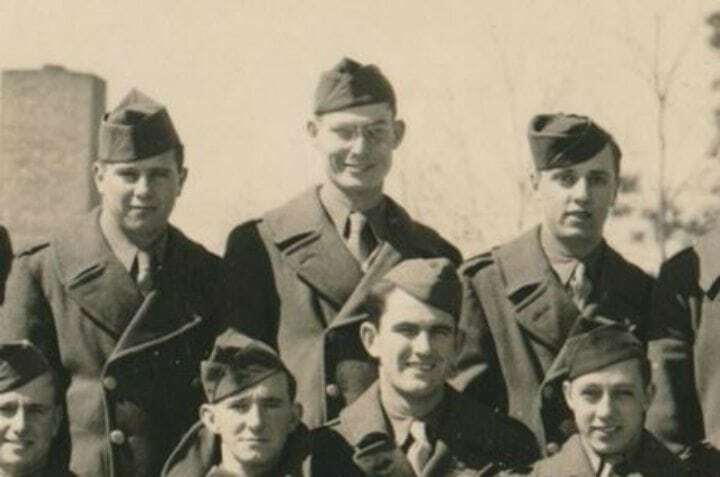 I consider this a greater honor than being president,” Truman touchingly told Doss, who further made history as the country’s first conscientious objector to receive the award. But his amazing story didn’t end there. 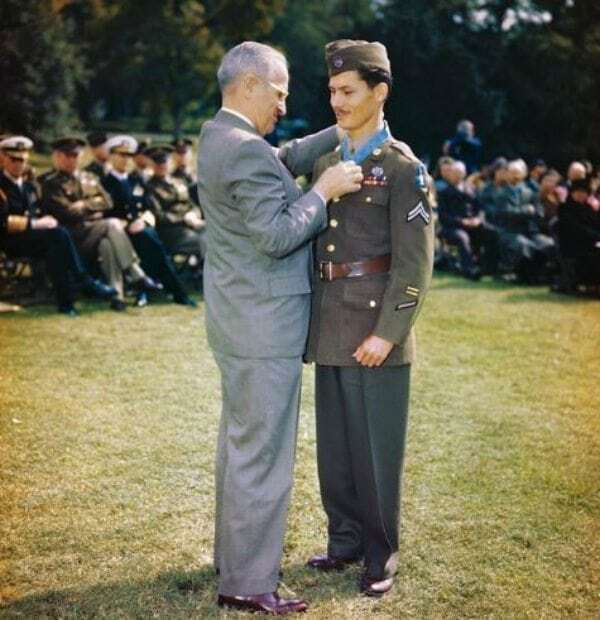 For his brave service in the face of peril and injury, Desmond Doss also received Bronze Star and Purple Heart medals. 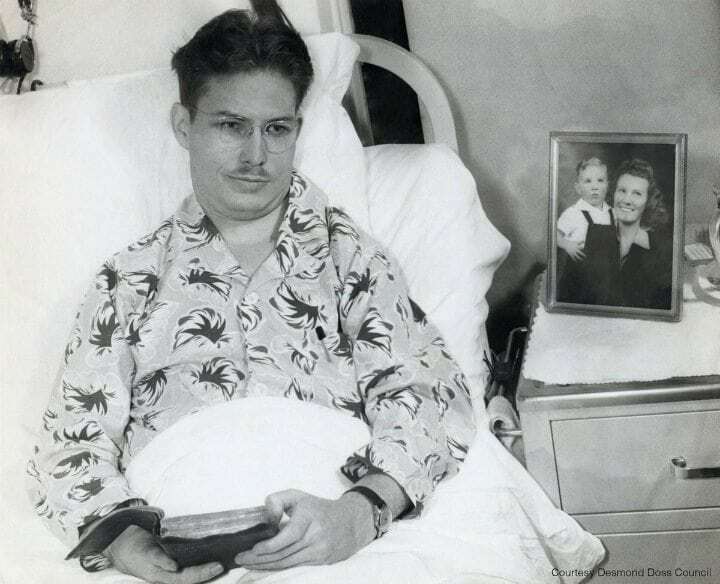 Unfortunately, due to all those cold, wet, sleepless nights during the war and the injuries Doss had sustained, the celebrated veteran was hospitalized for more than five years as he battled for his health. It was there in the hospital while recovering that Capt. Jack Glover, who had previously disregarded Doss, came to visit with a completely unexpected gift. As Doss uncovered the parcel, his heart leapt when he realized what the present was. 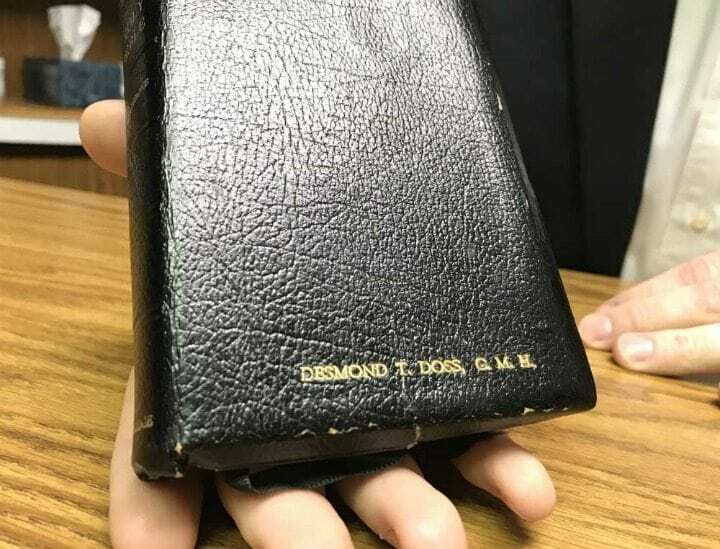 Doss looked in amazement as he realized he was holding a slightly scorched, soggy Bible. As it turns out, after the U.S. victory in Okinawa, Doss’ fellow soldiers could only think of one way to repay the man they’d previously mocked for his devotion. So, for hours, they sorted through all the rubble until they somehow managed to find his precious belonging. 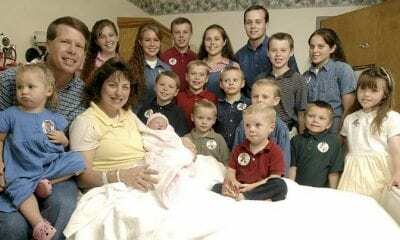 With the help of the God-given gift and his loving family, the man whom many considered himself a Godsend was eventually discharged from the hospital in 1951. Far from fading from memory, though, Doss’ legacy was further commemorated when, decades later, his story caught the attention of a huge Hollywood heavyweight. Over the years, WWII hero Desmond T. Doss had turned down many requests for book and film adaptations of his story. Due to his concern about their accuracy in portraying the events of his rescue of 75 servicemen, he rejected all offers, except one. 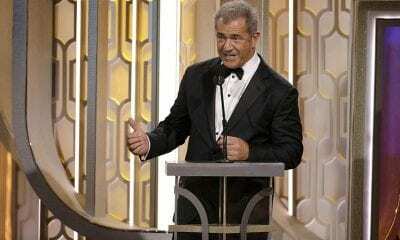 The only green light he gave was to Mel Gibson. 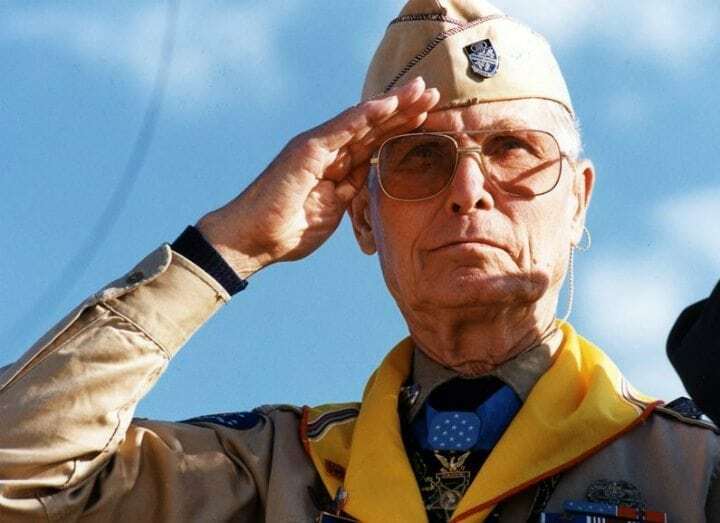 Inspired by the extraordinary tale of Doss’ unwavering faith and defiant service above and beyond the call of duty, Gibson brought the film Hacksaw Ridge to the big screen in 2016. 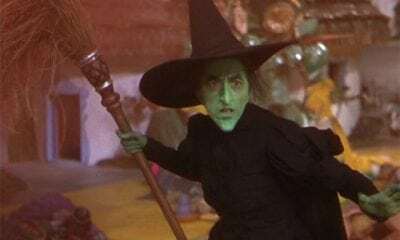 Critics and audiences alike were left tearful and in awe of the film that received six Oscar nods. But Doss’ memory also lives on in other ways. 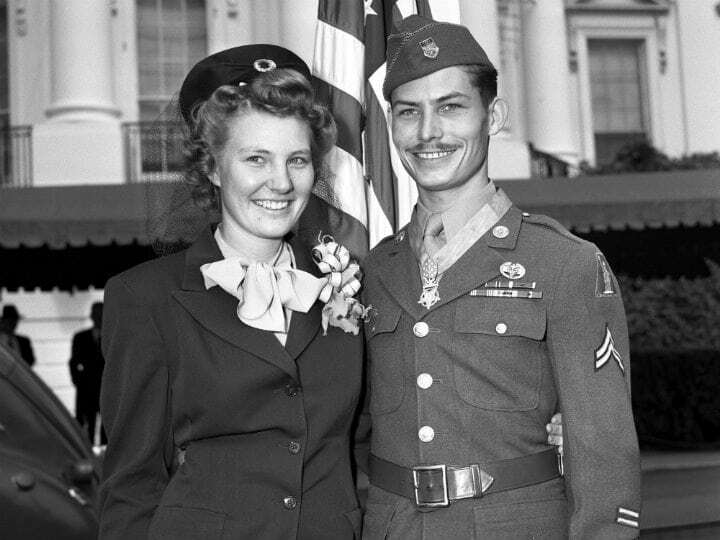 During his whole service, Desmond Doss never once picked up a weapon. Despite his injuries, he still managed to go on to raise a family. 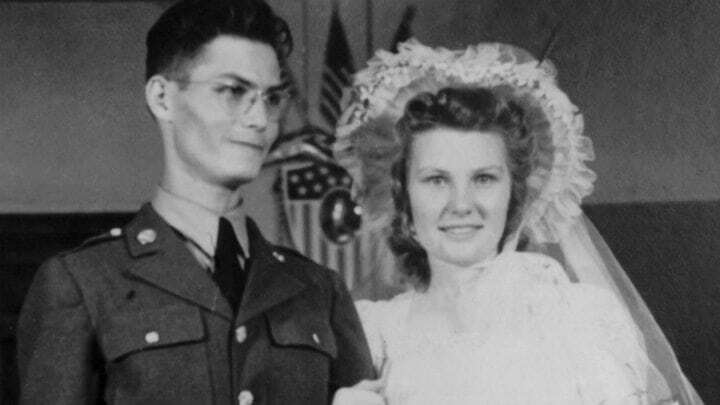 After returning home from war, his loving wife Dorothy gave birth to son Desmond “Tommy” Doss Jr. in 1946. If you liked this article, don’t forget to SHARE with friends!